Food Fare's Recipes-on-a-Budget Cookbook features more than 150 recipes for inexpensive meals, including breakfast, lunch, dinner, side dishes, beverages and snacks. The current economic climate has forced many households to trim their food budgets. Families either do without, or find ways to stretch ingredients in multiple dishes with inexpensive fillers. Ironically, as many also go without health insurance, they are forced to purchase "cheap" foods that are often unhealthy in order to feed their families. It doesn't have to be that way. With a little pre-planning, such as coupon-clipping and opting to buy generic brands, healthy food can be prepared to go a long way without exceeding the weekly budget. Not all dishes contained in the Recipes-on-a-Budget Cookbook are health-strict, but they are nutritious for the most part and affordable. 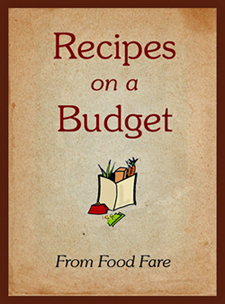 The Recipes-on-a-Budget Cookbook is available in Kindle, Kobo, Nook and PDF editions. Select your preference and get cooking! Take a look inside the Recipes-on-a-Budget Cookbook with our exclusive screenshots. See a complete list of recipes in the Recipes-on-a-Budget Cookbook and view free samples.